Image showing port side of Endeavour as it sits inside the Florida Space Authority Reusable Launch Vehicle hangar at NASA’s Kennedy Space Center. CAPECANAVERAL - NASA sent electrical power surging through shuttle Endeavour onTuesday, signaling the end of a major overhaul and its return to normal launchprocessing. 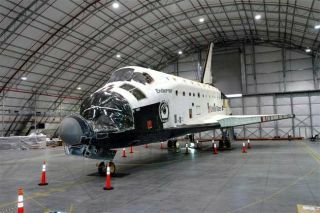 About75 workers gathered around the $1.8 billion spaceship when a red-and-white"Vehicle Powered" sign lit up inside the shuttle's hangar for thefirst time since August 2003. "Therewas certainly a big cheer that went up in that room when that sign litup," said Tassos Abadiotakis, NASA's lead vehicle manager at Kennedy SpaceCenter and the senior engineer in charge of preparing Endeavour for flight. "It'sreally a big deal when we've got the ship back together enough to power it upand start (preflight) testing on the vehicle." NASAsidelines shuttle orbiters after every eight flights for extensive inspectionsand modifications. Endeavour,which was built to replace Challenger after it was lost in a 1986 launchexplosion, was taken out of service in December 2003. The spaceship underwent124 modifications. Some were safety modifications ordered after the 2003Columbia accident; others already had been planned. A new "glass cockpit" that includes 11 full-color, flat-panel screens that display information about vehicle systems' performance. The display panels replace out-of-date cockpit instrumentation that included 32 gauges and electromechanical displays and four cathode ray tubes. New Global Positioning System navigation equipment that will enable a shuttle to land -- particularly in an emergency -- at any runway in the world. Shuttle orbiters now can only land at sites equipped with Tactical Air Navigation systems, which are primarily used by the military. A new power converter system that will enable Endeavour to stay at the International Space Station for nine to 12 days. The capability will play a key role in the amount of station construction work NASA can complete before the shuttle fleet is retired in 2010. Techniciansinspected more than 150 miles of electrical wiring. They replaced more than1,000 heat-shielding tiles, which protect orbiters and astronauts from intenseheat -- up to 3,000 degrees -- during atmospheric re-entry. A faulty brakingsystem critical to safe landings was repaired. The ship also was rigged so anew orbital inspection boom can be installed in its payload bay before its nextflight. Finaltests to Endeavour's new cockpit will be conducted during the next seven to 10days, and then technicians will begin about 8,000 preflight tests. Abadiotakissaid Endeavour will be ready to fly in about 10 to 11 months. Publishedunder license from FLORIDA TODAY. Copyright (c) 2005 FLORIDA TODAY. No portionof this material may be reproduced in any way without the written consent ofFLORIDA TODAY.